Sarcoidosis is a multisystem disorder of unknown etiology characterized by disordered immune regulation. Sarcoidosis is a disease that causes an inflammation of tissues of the body. It may occur in any body organ, but it starts most often in the lungs or lymph nodes. Sarcoidosis is very tricky to diagnose. So, basically we can say Sarcoidosis is an abnormal collection of inflammatory cells that form lumps that known as granulomas (gran-yu-LO-mas). Sarcoidosis usually appears to begin in skin, lungs and lymph nodes. It mostly affects the lungs, eyes, heart and brain but can also affect other organ systems. People can get Sarcoidosis at any age, it commonly affects adults between ages 30 to 40. The NHS estimates that Sarcoidosis affects one person in every 10,000 people in the United Kingdom. In some people, symptoms appear very suddenly but are not very long lasting. This is called Acute Sarcoidosis. The symptoms of Acute Sarcoidosis are swollen lymph nodes, tiredness, fever, joint pains and rashes on the legs. When Symptoms develop gradually and last longer i.e. long term, is called Chronic Sarcoidosis. People with chronic Sarcoidosis, have fewer symptoms, but the symptoms may get worsen with time. Sarcoidosis affects any organ system. It is a systemic inflammatory disease. Although in many cases it is an asymptomatic. Sometimes Sarcoidosis patient think that they have the flu or a respiratory infection. Eye irritation, bumps on eyes. Sarcoidosis is a spontaneous disease which has unknown cause. According to research, an infection or exposure to something in the environment can trigger the immune system of the body to overreact. It may be a type of autoimmune disease that is associated with an abnormal immune response. Sarcoidosis, spreading from one part of the body to another, is still being studied. Sarcoidosis may be very difficult to diagnose because the disease has very few signs and symptoms in its early stages. The doctor will most likely start with a physical exam, including a close examination of any skin lesions a person has. Eye exam to check for vision problems that may be caused by Sarcoidosis. The word Ayurveda is a Sanskrit term. Ayur meaning 'life' and Veda meaning 'information' or 'science'. 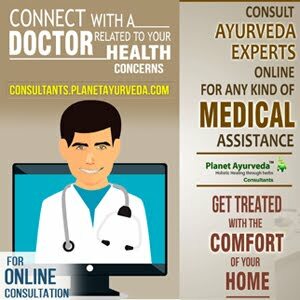 Ayurveda is an ancient method to treat diseases. It is the best way to treat several diseases with natural herbs and home remedies. According to Ayurveda, an imbalance in any of the tridosha (vatta, pitta and kapha dosha) leads to health problems. Our experts of Planet Ayurveda say that Ayurveda mainly works on the symptoms associated with the disease and reverse the damages. According to modern medical science – The cause of Sarcoidosis is unknown. 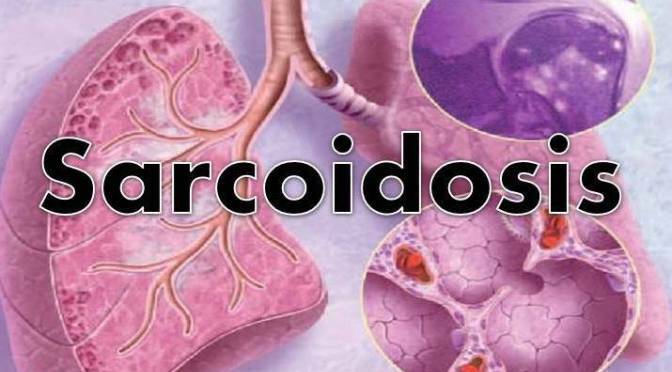 Although there is no specific treatment for Sarcoidosis, but according to Ayurveda Sarcoidosis is caused by generation of endotoxins (Ama) in the body There are many herbal remedies for Sarcoidosis described in Ayurveda. The name of the disease may be "Ama-Vata (similar to Rheumatism pathogenesis) or Sannipaitik Aamaj Granthi Rog." The treatment described in Ayurveda is as per the doshic theory i.e. maintaining the balance of Vata-Pitta-Kapha. 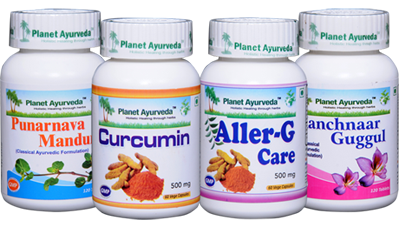 Curcumin capsules are very effective herbal remedies offered by Planet Ayurveda for treatment of Sarcoidosis. Curcumin is the main active compound present in Turmeric (Curcuma longa) which is responsible for the remarkable effect on Sarcoidosis. Planet Ayurveda's Curcumin Capsules contain standardized extract of 'curcuminoids' which is present in Turmeric. Curcumin capsule is an herbal supplement that helps to maintain healthy body and mind. Recommended Dosage of Curcumin Capsules:- 2 capsules, twice daily, with plain water after meals. The product is a combination of Guggul (Commiphora mukul) and Kachnaar (Bauhinia variegata). Guggul is combined with many other herbs like Kanchnaar to form different types of natural supplements that help to support and maintain health. Dosage of Kanchnaar Guggul:- 2 tablets, three times per day, with plain water after meals. Aller-G Care Capsules is another herbal preparation from the house of Planet Ayurveda. This formulation is great for healthy lung functioning and maintaining normal breathing. The ingredients are absolutely natural and safe and do not have any side effects. Dosage of Aller G Care Capsules:- 2 capsules, two times in a day, with plain water after meals. Punarnava (Boerrhavia diffusa) is an herb that derives its name from a Hindi word which means 'everlasting youth'. It helps to support healthy cell growth and function. People at any age can safely take this dietary supplement for the maintenance of their health. Dosage of Punarnava Mandur:- 2 tablets, two times per day with plain water after meals. Our Planet Ayurveda Doctor and expert team prepared their products using the best quality of herbs and by following principles of Ayurveda. All their herbal products are made from natural herbs. All these products available at Planet Ayurveda are free from starch, binders and preservatives. No colours, additives, yeast and fillers are added to theses miraculous supplements.